CEI is a large-scale industrial paint and powder coat coating company operating out of a 34,000 square foot facility that houses media blasting, powder coating, warehouse, and painting capabilities under one roof. CEI Coatings offers a wide range surface finishes including media blasting, powder coating, and painting for all your manufacturing, industrial, fleet and commercial needs. All surface finishes are applied by our experienced and trained technicians utilizing the latest equipment and technology. Our capabilities include the latest surface preparation techniques ensuring superior adhesion and durability for all your finished surfaces and the ability to support large volumes or large items. Our Quality Assurance lab includes the ability to digitally measure film thickness, adhesion, pencil hardness, gloss level and surface profile. CEI powder coating services provides you with a long lasting, attractive, and environmentally friendly alternative to paint. CEI offers a full range of media blasting services including handling large items, production projects, and stock cleaning, stripping and preparation. CEI delivers high quality paint finishes for every project, from fleet collision repair, aesthetic maintenance and complete repaint services to large scale projects. Our focus on these core values allows us to adapt to our customer needs rapidly and efficiently, providing predictable and repeatable results with short turn around times and complicated procedures. CEI Coatings leadership combines years of technical expertise with decades of professional management experience to deliver high-quality finishes and easy integration into your existing business processes. CEI currently provides fleet collision repair, aesthetic maintenance and complete repaint services for a variety of clients. With our 60’ media blasting booth and two 56’ paint booths, we can accommodate all standard freight trailers, large vehicles, and equipment ensuring the quality of paint your company expects on its most important assets. Within our facilities we can accommodate most projects including large items and large volumes. 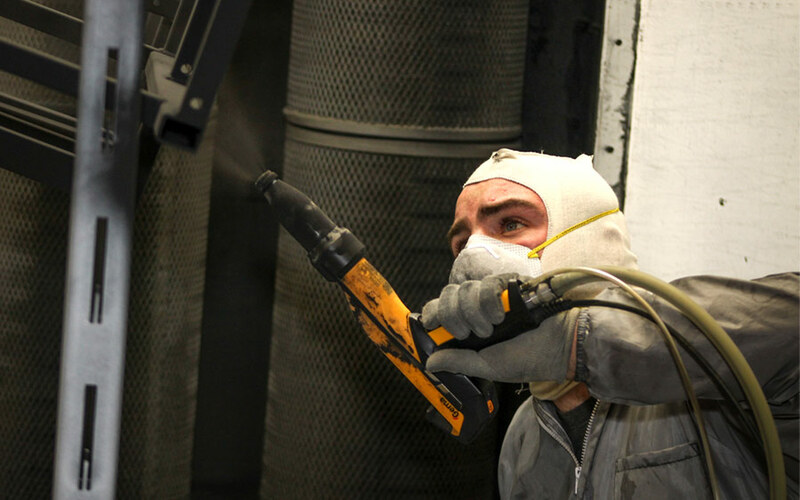 With the space available inside our installations, all paint, media blasting and powder coating is done indoors. All our installations are located in secure lots with restricted entry and automatic gates, assuring the security of all your projects.